Kate and I met in the fall of 1960 while college students at TCU. I was a junior. She was a sophomore transfer from Stetson University. We met at a Sunday night social at the home of another student and high school friend of Kate’s. Apart from meeting, neither of us remembers anything else about that night or any contact that we had between then and December 19, 1961. That’s when we had our first date. I had obviously noticed her and believe we had a class together that fall. I asked her to a performance of Handel’s Messiah. We had no idea that we would be married almost 18 months later. Neither did we imagine how important the performing arts would be to our marriage, especially during this chapter of our lives. In some ways, we were from two different worlds. Kate was born and raised in Fort Worth where TCU is located. I was born and raised in West Palm Beach. Her father was from a family of 8 children, 6 of whom lived their entire lives in Fort Worth. Only one of the eight children lived out of state. That meant Kate grew up with lots of aunts, uncles, and cousins. I, on the other hand, had no relatives living in West Palm except for my mother, father, and brother. I had grandparents who lived in Tallahassee along with an uncle and two cousins, but we rarely saw them. My other grandmother lived in Cincinnati and stayed with us during the winter. We both grew up in Methodist families, but her family was more actively involved in church than mine. In addition, West Palm Beach was a much more secular place than Fort Worth. Our first date came near the end of the first semester of my senior year. I took a part time job at a funeral home at the beginning of my second semester. This job turned out to play a central role in our courtship. I was on a tight budget; so I didn’t have much money to spend on dating. The funeral home offered a couple of perks that helped me with this problem. First, as flowers were transported from the funeral home to the cemetery, there were always some that came loose from the bouquets or stands on which they were fixed. Sometimes I would pick up a carnation or rose and drop by the campus to place it in the driver’s seat of Kate’s car. Another benefit involved my occasional trips to another city like Austin or San Angelo to pick up a body and bring it back to the funeral home for a service and burial. When I was on these trips, the company paid for my meals. They let me take Kate along and also picked up her meal as well. We’d have a nice dinner. Then we stopped by the funeral home to pick up the body, and bring it back to Fort Worth. Looking back, it’s hard for me to believe that Kate’s parents never had a problem with this. At least they never said anything. Kate and I married on May 31, 1963, and lived in Fort Worth the next two years. We both pursued master’s degrees at TCU, she in English and I in sociology. She taught English at a local high school. I had an assistantship in sociology for which I taught introductory sociology. Upon the completion of my MA in the summer of 1965, we moved to Madison, Wisconsin, where I started a PhD program in sociology at the University of Wisconsin. Kate took a job as a secretary to the director of graduate admissions in the English department while finishing her master’s thesis. We both considered our three years in Madison as a very special period in our marriage. We felt like this was the first time for us to be on our own since we had lived our first two years in Kate’s hometown. Neither of us had ever been to Madison before that July afternoon when we drove into the city. The university, the town, and the friends we made there changed our lives in lasting ways. Because there were so many spouses applying for teaching positions in the public schools in that area, Kate was unable to get a teaching job. That turned out to be a good thing. She became a secretary to the director of graduate admissions in the Department of English. He was quite a scholar and a very interesting man. He and his parents, German Jews, left their home country in 1938 as Hitler’s persecution of Jews rose to new heights. Several years later, one of her friends at TCU married her boss, and Kate kept up with him until his death in 2015. This relationship provided Kate with a strong bond to the university even though she was not a student there. In July 1968, we moved to Raleigh where I took a position as Assistant Professor of Sociology at North Carolina State University. Like the move to Madison, this one signaled the opening of a new chapter of our lives. I was beginning my professional career, and Kate was pregnant with our first child, Jesse, when we made the move. Two years later our son, Kevin, was born. During the Spring of 1971, I joined the faculty of the Department of Sociology at the University of Tennessee. So off we went on a new adventure in Knoxville, where we have lived for the past 47 years. I taught at the university for seven years while Kate cared for our two children at home until they were in preschool. Like most other parents, our lives were wrapped up in our children. Kate, who didn’t cook at all before marriage, became quite a cook. Just about everything she learned came from her mother who had a reputation as an excellent cook and hostess. Not everything she knew about cooking came from her mother though. During the early 1970s, she became a fan of Adele Davis. She also took great interest in our childrens’ diets. She wanted them to have meals that were nutritious. Even their snacks were nutritional. She made homemade yogurt regularly and mixed it with orange juice for frozen popsicles. She made homemade whole wheat bread and pizza with whole wheat crusts. When Kevin was about a year away from first grade, she enrolled in a master’s program in library science. She completed her second master’s degree in 1977 and began a career as a librarian/media specialist with the public school system. As she did, I left teaching to embark on a career in my own market research business that continued until my retirement in 2012. In 1990, shortly after her father died, Kate retired from the public school system and became a volunteer librarian at our church. This turned out to be a very fulfilling position for her. She was well-qualified professionally with an MA in English and a second master’s in Library Science. Beyond this her background in church and her personality made her a natural for this position. She loved working with the staff and the members, especially the children, and served in this position 19 years. Her only reason for retiring was her Alzheimer’s. That made her work more challenging. She just couldn’t handle it in the way she had in the past. As a volunteer, her work provided her a good bit of flexibility that she hadn’t had with the school system. That was important because my professional career involved a lot of travel. Occasionally, especially if I had a meeting in New York, she traveled with me. Either before or after my business obligations, we would enjoy ourselves. In New York that meant attending Broadway shows. It was also a time when both of our children had graduated from college and established their own families. In 1998, our first grandchild was born. Since that time we have added 4 others, 2 sons from our daughter and her husband and 2 sons and a daughter from our son and his wife. Up until the oldest was 15 or 16, they visited us one child at a time for a week each summer except for our daughter’s twins. They always came together. More recently, we have discontinued this practice as it became more challenging for me to handle both Kate and a grandchild. On January 21, 2011, Kate was diagnosed with Alzheimer’s. At the time, we didn’t envision the full impact of this diagnosis, but we have devoted ourselves to making the most of our time. I am satisfied that we have done that. As you will read in my posts, we have been more fortunate than most couples. 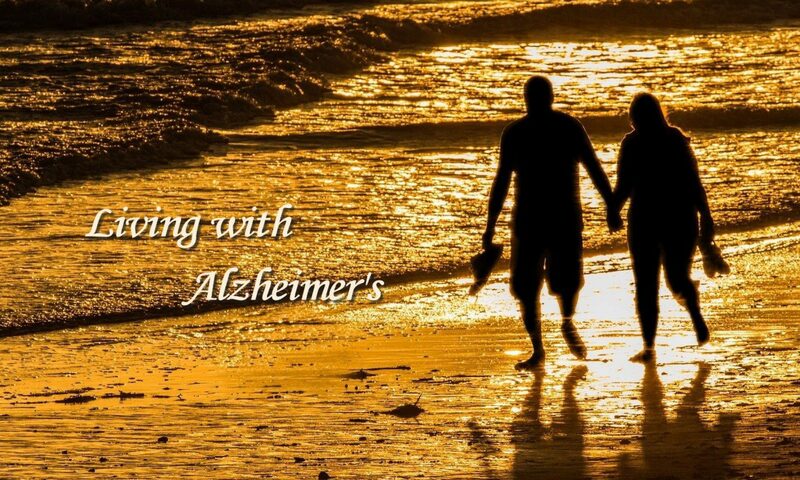 We have continued to enjoy life and each other since her diagnosis even though “Living with Alzheimer’s” has radically changed our lives. I only wish this could be true for everyone who faces this disease. I am not naive. I recognize that the most difficult part of this journey is still ahead. Whatever happens, I will always be grateful that we have been able to celebrate life together during the past 55 years.